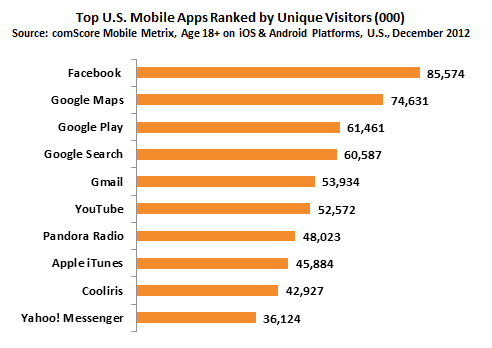 Data from the latest comScore Mobile Metrix ranking of the top smartphone apps shows that the combined number of unique monthly users of Facebook’s native apps across Android and iOS surpassed the previous leader, Google Maps, in September of last year for the first time. The data relates only to those in the United States and over the age of 18. 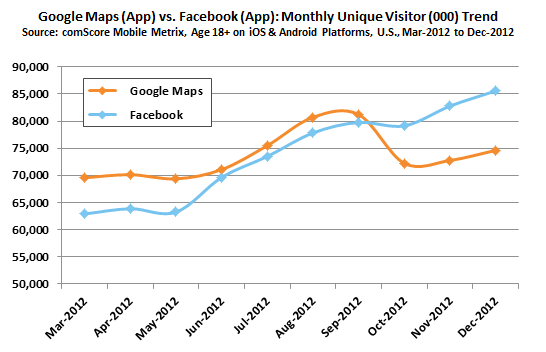 By December 2012, Facebook reached 85,574 unique monthly mobile users (with the above platform and demographic limitations), compared to the number two seed Google Maps on 74,631 unique monthly users. Google Maps led the mobile app charge all through 2012 until September when Apple released iOS 6. iOS 6 was of course released with Apple’s new Maps apps – and all the ensuing controversy – replacing the pre-installed Google Maps app engineered by Apple. Since October, Google Maps has slowly been gaining ground again, and, with the release of an official Google Maps app last month, is sure to do so quite quickly in 2013. It’s also interesting to note that of the top six mobile apps across Android and iOS, five of those are Google-owned: Google Maps, Google Play, Google Search, Gmail, and YouTube. Perhaps Apple should be worried that the most popular apps on its platform are not those developed in-house, but apps developed by a competing (and winning) platform – Android. Regarding app engagement, Facebook agains wins easily with 23% of all time spent using mobile apps going to Facebook. Another 3% of time is spent using Facebook-owned Instagram. Combined Google apps account for 10% of time spent on mobile apps.  Archived in General and tagged Android, comscore, Facebook, google, google maps, iOS, mobile metrix, United States. Bookmark the permalink.